Home » [Industry] Retail » What Could the Echo Show Mean for Marketers? The June 28 release of Amazon’s Echo Show, which combines digital in-home assistant technology with a seven-inch video screen, is making waves among tech lovers and bringing us one step closer to living like The Jetsons. Marketers for retail brands are especially interested in studying this technology and figuring out what implications or opportunities it might present. As a marketing technology solution born out of a retail business, many assume this new digital assistant will have robust tools to drive new retail experiences and consumer activities. Amazon has remained relatively tight-lipped about how the technology might be utilized, and it remains to be seen how consumers will receive and engage with the technology, but from its specifications and what Amazon has said so far, it’s clear retail marketers will be affected, and in more than one way. The new device is certain to increase the frequency of voice searches generated by in-home digital assistants. Previous Amazon products have already offered this feature, but mass adoption and use of this new solution will incrementally change how much attention retail marketers must pay to natural language search. Of far greater—and unknown—influence is the video screen featured on the device, which can be used in many different ways. Amazon has already demonstrated its ability to make voice calls and even check home security cameras. YouTube, weather forecasts, shopping lists, music lyrics, and photos: All of these will be available through the video screen. But what hasn’t been mentioned might be even more influential. It’s inevitable that Amazon will need to monetize its digital assistants to generate revenues. The video screen offers a natural platform for displaying ads, including immersive ones—as GeoMarketing notes, it’s just a matter of balancing ad exposures with consumer patience for these interruptions. 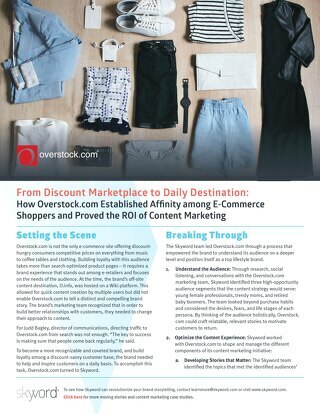 Display advertising is one opportunity retailers will certainly find. But the real gamechanger is how the in-home solution will drive new visual experiences. The Echo Show might be a groundbreaking technology in a nascent field, but it’s something consumers have been waiting on for quite some time. They already have expectations for the kinds of functionality it will offer, and it’s a safe bet that Amazon will accommodate those expectations—if not right away, then in the near future. Based on the success and engagement seen with Amazon’s Look, a Business Insider survey expects it to be a big hit with consumers, particularly where fashion and retail apparel are concerned. With Amazon’s Look, consumers already had the option of using a built-in camera to take pictures of their clothes and get fashion recommendations from a mix of stylists and AI solutions. This new in-home solution will take that one step further, leveraging its video screen to display those recommendations and make them available for purchase through its touchscreen functionality. It’s likely the solution will also be used to bring augmented reality to online clothing shopping, giving shoppers the ability to try on clothes virtually before making a purchase. The benefits won’t be limited to retail apparel, even though that industry is certain to be one of the biggest beneficiaries. On a more fundamental basis, consumers will have an easier time using voice search to find products they might be interested in. A voice-originated query could pull up a range of products that the consumer can easily scroll through, consider, and purchase when they’re ready. Like its rivals, Amazon knew a video solution was key to bringing digital assistants to the next level, and that a visual interface would be crucial to driving retail and other experiences through the platform. Some of its opportunities are obvious. Others will be discovered, as brands (and Amazon itself) experiment with how the platform can deliver new content and experiences. Most retailers are predisposed to viewing Amazon as the “bad guy.” The Echo Show certainly won’t change that dynamic, but it does add some complexity to the relationship. Even though Amazon will be indirectly benefiting from retailers’ participation, the success of its latest in-home solution will give retailers little choice but to try to leverage the platform as best they can. Consumers will be the ones to decide whether the visual digital assistant becomes a major digital marketing tool, but if that happens, it doesn’t spell the end for retailers. In fact, early-adopting and tech-savvy retail brands could stand to benefit from the solution by marketing their own products through the platform. For retailers with a limited physical presence, this could make their products more accessible to a larger population and increase sales nationally and around the world. The use of augmented reality could facilitate consumers remotely trying on items, and well-crafted voice-search marketing can help elevate your brand over competitors on Amazon. Meanwhile, as the market for video-based assistants grows, alternatives outside of Amazon will surely become available. Retailers can expand their digital assistant marketing strategies to those competing products, maintaining a presence on Amazon while diversifying to reach a larger share of their overall market. Whether or not you already use Amazon to sell your products to consumers, it’s risky to dig your heels in the ground and resist the in-home solution based on the company creating it. Like it or not, Amazon is leading the way in an important innovation that will significantly impact the retail industry, especially clothing retailers. Yes, you might be helping Amazon by using its technology to try to reach consumers, but in the long run, you’ll probably cause much more damage to your brand by abstaining from the marketing technology entirely. Retailers will likely see this as a case of choosing the lesser of two evils. It’s hard to argue with that outlook, but it needs to be tempered with a focus on the long game. Disruptive transformation is sweeping the retail industry, and executives are facing real pressure to innovate and evolve their organizations before they get left behind. Any executive worth his paycheck should be willing to at least explore the Echo Show’s marketing opportunities. Ignoring its potential would be a disservice to any retail brand. The post What Could the Echo Show Mean for Marketers? 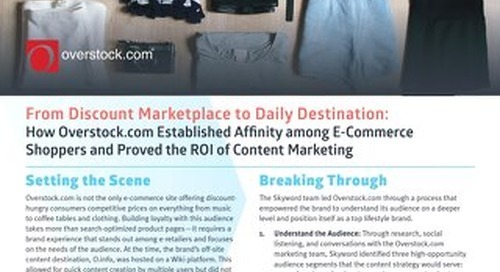 appeared first on The Content Standard by Skyword.